Public sticklers have annoyed me forever, and I’ve been meaning to write about that, but recently in a post titled “Editors, Would You Do Me This Tiny Favour?” Katy McDevitt at PublishEd Adelaide did a great job of it herself. Let’s kick that greengrocer’s apostrophe myth to one side and focus on the huge, constructive contributions that editors make, whether that’s helping authors to achieve clear, polished English, restructuring awkward passages of text, or any of the dozens of other ways we fix, polish, hone, and otherwise make a book ready for its star turn. Exactly. 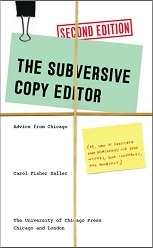 When copyeditors brag that they haven’t overlooked a typo since they were twelve, they reinforce the image of a superficial reader with her elementary-school list of rules chopping away at the weeds without noticing the forest or where the path is headed. They relegate our profession to the status of other stereotypes that ignore the challenging, creative, intellectual aspects of a job: the librarian who is there to shush, the accountant to count beans; the novelist to crank out what everyone would if they* only had the time. We’ve all seen how a post that derides sticklers attracts a raft of commenters who insist that without attention to punctuation and grammar, communication and trust are compromised. I get it. We all get it. But can’t we take it for granted that scrupulous attention to grammar and punctuation is a part of copyediting, instead of elevating it to the definition of what we do? Scolding about typos and pouncing on errant apostrophes are cheap grabs for low-hanging fruit. And much of it is misinformed and counterproductive. Public sticklers waste our time on outdated rules or rules that never existed in the first place. And they waste our time by drawing focus from the point of an article or post. How many times does a fussy commenter ignore the subject entirely in pointing out a typo? Other commenters then pile on to chastise or encourage, and all hope of intelligent conversation is lost. Is that the kind of reading you would want for your own book or article? Finally, there’s a basic discourtesy in the “You missed a spot!” way of life. Confirmed sticklers could redeem themselves by pointing out typos kindly and discreetly. Even better, they could comment on the actual content and add their corrections as a postscript. Writers are trying to communicate something–and writers are not the best proofreaders and copyeditors of their own work. It would be helpful if all those cheerleaders for communication could focus a little more on the message and put the occasional grammar or punctuation gaffe into proportion. *Readers who wish to comment on this use of they are requested to support their comments with two current, authoritative sources. who works with words (or with people)? it might be just the thing.